Exciting news! 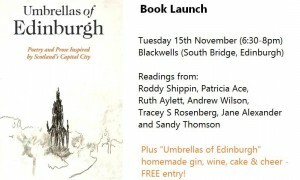 Two of my poems were included in Umbrellas of Edinburgh, a new anthology of poetry and prose about Edinburgh. My poems ‘Every Trip I Have Taken to the Royal in 8 Years’ and ‘Making Bubbles outside the Modern Art Gallery’ sit alongside the work of some 70 other writers – a bumper collection covering the length and breadth of the city. Come on a journey. We begin at Blackness Castle, Edinburgh Airport, the Bridges in the far west, then on to Dean Village and the National Gallery of Modern Art in the West End, via Murrayfield, Tynecastle and the Diggers pub. Next to the Cafe Royal, South Bridge, Nicolson Square in the centre, taking in the Scott Monument and Princes Street on the way. The Royal Mile and Cowgate make way for Morningside and the Royal Observatory on Blackford Hill. These are just some of the unforgettable locations that inspire the poetry and occasional prose in Umbrellas of Edinburgh. Scotland’s capital has always excited the literary mind; the narrow cobbled streets and ornate turrets a contradiction crying out to be explored and fashioned into metaphor. 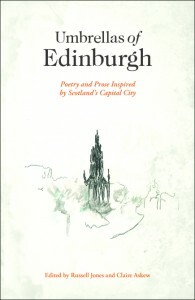 This is a landmark anthology containing the work of seventy writers including Ryan Van Winkle, JL Williams, Aonghas Macneacail, Gerda Stevenson, Pippa Goldschmidt, Hamish Whyte, Jane Goldman, Theresa Muñoz, Rob A Mackenzie, Colin Will, Richie McCaffrey, Sophie Cooke, Forward Prize-shortlisted Harry Giles and Edinburgh Makar Christine De Luca; a selection that perfectly demonstrates the vitality of the Scottish literary scene. The official launch event was November 3rd to great fanfare! But don’t worry – there’s still time to get involved! Additional launch events at Blackwells will take place on Tuesday 15th November (6:30pm) and Tuesday 22nd November (6:00pm). Hope you can come along! So far they promise readings, drink, cake, tote bags and general literary merriment! Edit: Some writers will be reading their work at the Cameo on the 20th November to coincide with the preview screening of the new Jim Jarmusch film, Paterson. Another way to check out Umbrellas of Edinburgh and catch a movie at the same time!